Nearly 50 years ago, upstart high-end sports car manufacturer Lamborghini set the performance car world on its ear with its stunning supercar, the Miura. Wrapped in a svelte Marcello Gandini – designed body and powered by a 350-horsepower V-12, the Miura instantly made every other car look antiquated. In 1974, Lamborghini again shocked the automotive world with the mad Countach (an Italian expression one might utter at the sight of a beautiful woman), another Gandini masterpiece. Wide, low, and menacing, the original Countach completely recalibrated the supercar template. The Diablo replaced the Countach in 1990 and was the last of the Lamborghini supercars under the auspices of the “original” company. Audi acquired the company in 1997 and would bring significant German efficiency to bear, turning out supercars to a new template: the Murielago in 2001, the Gallardo in 2003, the Reventon in 2008, the Aventador in 2011, and, most recently, the appropriately named Huracan. Each one is an ultimate car. Many were collector vehicles from the moment they rolled off the production line. Beneath their stunning bodywork lie chassis and powerplants bristling with the best technology of their respective eras. Lamborghini’s latest supercars zip from 0 to 60 miles per hour in under 3 seconds and hit top speeds in excess of 220 miles per hour. Their prices are equally staggering. 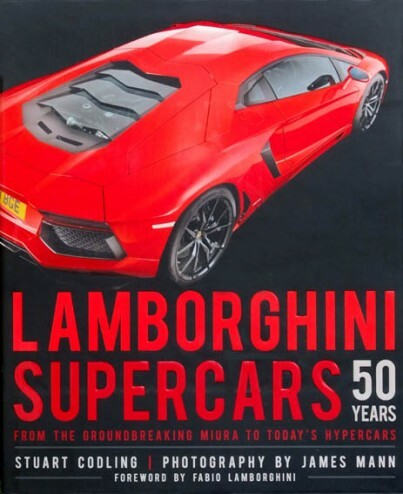 Lamborghini Supercars 50 Years is devoted exclusively to all of Lamborghini’s ultimate performance cars. No enthusiast of these world-class sports cars will want to miss it!